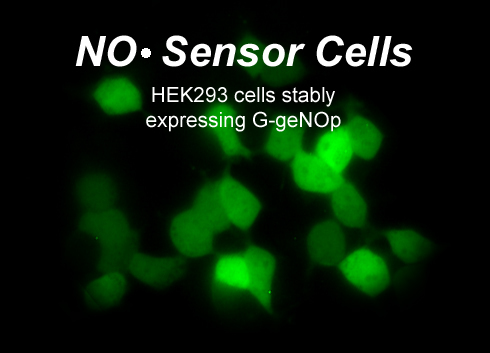 Stably G-geNOp expressing HEK293 cells. 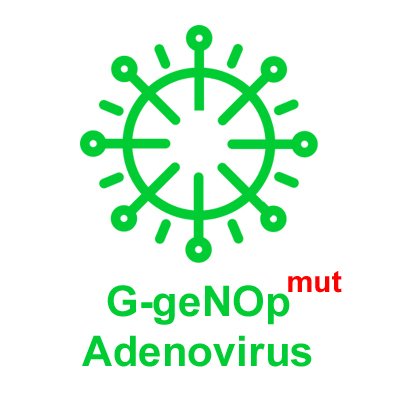 All cells express the NO sensitive green G-geNOp, which is quenched by NO. Accordingly, this cell line can be used as a NO detection tool e.g. to test NO-releasing compounds (see Figure below), in co-culture with NO producing cells such as macrophages, neurons, endothelial cells or even bacteria. Notably, sensor cells have been also used for in vivo imaging of neurotransmitter release in the brain of living mice (see reference). Figure legend: Green traces represent original fluorescence signals of G-geNOp stably expressed in HEK293 cells over time in response to high and low NO donor concentrations as indicated. 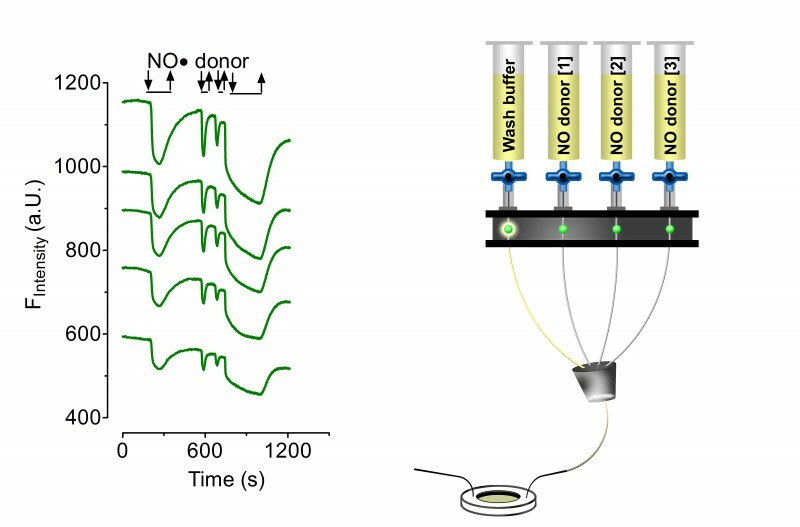 NO donors were applied and removed via a gravity-based perfusion system (right panel). Thaw cells and culture them as usual at least for one week. Seed 5.5×105 cells for next day or 3.5×105 cells for the day after next day on a 30 mm microscope cover glasses into a well of 6-well plate. Prior to measurements preincubate cells with iron(II) booster solution for 20 minutes. Wash cells with medium or PBS and keep cells for 1-2 h in a storage buffer (culture medium) until you start your NO imaging experiments. Image cells using standard filter for GFP. 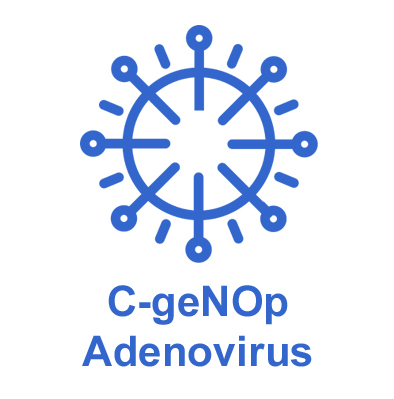 For further information see the description of G-geNOp.